This cabin, one of Nebraska's oldest structures, was built in the summer of 1855 as the home of Allen B. Mayhew, his wife, Barbara Ann (Kagy) Mayhew, and their sons, Edward and Henry. John Henry Kagi, Barbara Mayhew's brother, lived briefly with the Mayhews before joining abolitionist John Brown in Kansas. In February 1859 Kagi helped Brown lead eleven Missouri slaves to freedom in Iowa via Nebraska City. During the trek Kagi narrowly avoided arrest while at the cabin. He was killed in October 1859 during Brown's raid on the Harpers Ferry, Virginia, arsenal to seize weapons for a slave uprising. Beginning in the 1870s, stories and recollections about this turbulent era credited the cabin as an Underground Railroad station. Edward Mayhew recalled Kagi once bringing fourteen black persons (possibly escaping slaves) to the cabin for breakfast. When the cabin was moved several feet in the 1930s due to highway construction, a "cave," allegedly used to hide freedom-seeking slaves, was recreated nearby. Legends connecting John Brown to the Mayhew cabin made it a popular tourist attraction devoted to the antislavery cause. 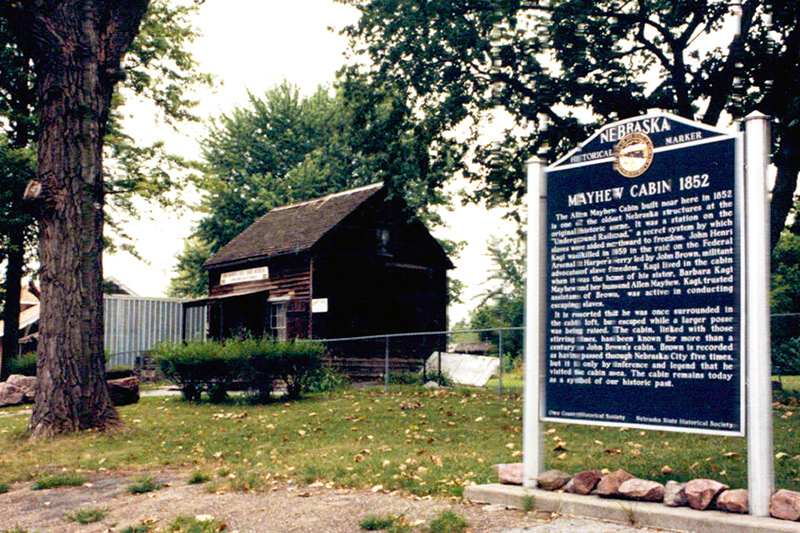 “Mayhew Cabin 1855,” Explore Nebraska History, accessed April 19, 2019, https://mynehistory.com/items/show/390.